Browse the latest new homes by Larkfleet Homes nationwide. ​Larkfleet Homes is part of the Larkfleet Group, a privately-owned housebuilding and development organisation with a strong record in creating sustainable homes and communities. Many of its developments are in Lincolnshire, Cambridgeshire, Northamptonshire and Rutland, close to where the company is based, but it has expanded across the UK with new build properties available all over the country. 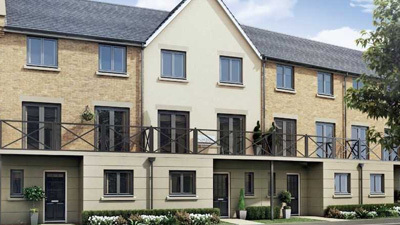 Larkfleet Homes has a varied portfolio, specialising in timber frame houses, with homes that are ideal for first-time buyers and growing families, but it also offers quality age-exclusive housing for the over-55s. The housebuilder also offers several incentives for those looking to purchase one of its homes. These include the government-backed Help to Buy scheme, Part Exchange, Assisted Sale, the Homeowners Club Reward scheme, which gives purchasers of a Larkfleet Homes property access to discounts across the UK and Personalised Home, a scheme designed to reward those homebuyers who use a recommended financial advisor and preferred solicitor with £500 towards personalising their new home. Sustainability is a huge part of the company’s building methods, with its commitment to providing energy-efficient homes, which could save homebuyers money on energy bills. Larkfleet Homes offers renewable technology such as PV panels on many of its properties. Larkfleet Homes also has a sister company, Allison Homes. Choose a Larkfleet Homes development in this area.